The following demos use the factory patches in the JP-08, JU-06, and JX-03 sound modules. The only effects added are those included in the modules. These sounds work great on their own for retro styles, and excel at adding analog character and warmth when layered with modern keyboard sounds and computer-based virtual instruments. Using the hands-on controls on each module, it’s easy to tweak these sounds to your individual needs, or start from scratch and create your own all-new sounds. You can store your custom sounds in user memories on the modules, and also back up your patch collections to your computer via USB. You can listen to the demos in the players below. To download full-resolution, 44.1 kHz/24-bit WAV versions for listening in your own studio environment, click a player’s title to go to the playlist at the Roland U.S. SoundCloud page, and then use the download links for each track as desired. The JP-08 recreates the massive sound of the JUPITER-8, one of the most coveted analog synths of all time. Featuring 36 knobs and sliders from the original JUPITER-8 front panel, the JP-08 is highly programmable and adds enhanced functionality with extra LFOs and expanded VCO range. The JU-06 embodies the JUNO-106, an ‘80s Roland classic still sought after for its warm sounds and instant sound-shaping controls. The 23 grab-and-go parameters from the original are included on the JU-06’s front panel, and the famous JUNO chorus effect is onboard as well. New enhancements include a faster LFO and continuously variable high-pass filter. The JX-03 module carries on the legacy of the JX-3P. This great-sounding analog poly synth was introduced in 1983, and is notable as one of the first commercial synths to include MIDI. The JX-3P had a streamlined, button-driven interface, but was highly programmable when paired with the PG-200, an optional controller unit. The JX-03 inherits all 24 knobs from the PG-200, plus the JX-3P’s distinctive tonal character. Added extras in the JX-03 include new waveforms, expanded DCO range, and cross-modulation options. 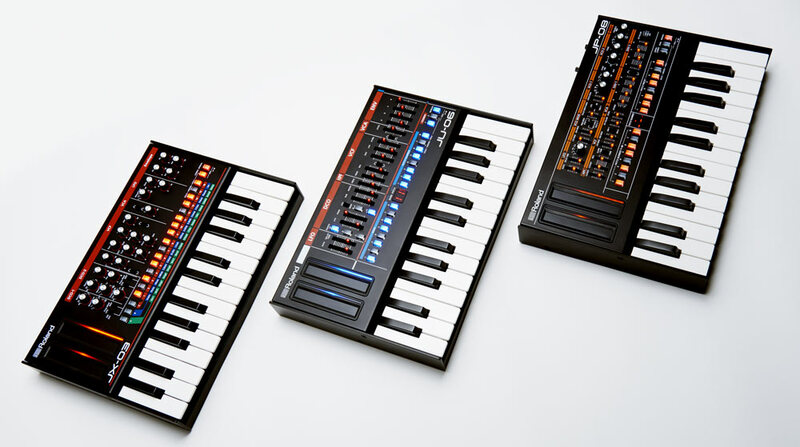 Compact and convenient, the Roland Boutique series makes it simple for today’s music creators to use the sounds of legendary Roland analog synths live and in the studio. Each module features all the panel controls found on the synths they’re based on, while ACB recreates the sounds in meticulous detail, right down to the component level. On their own, the modules function as MIDI sound sources in a stage or studio setup. Alternately, each can be docked into an optional K-25m Keyboard Unit to create an ultra-compact standalone synth. Standard MIDI I/O connectors allow you to interface and sync with your other MIDI gear, while USB enables audio and MIDI communication with your music computer. It’s also possible to chain multiple modules of the same type (JP-08 to JP-08, JU-06 to JU-06, etc.) together via MIDI. With this setup, the master module controls all connected modules, essentially creating a single integrated synth with increased polyphony. Roland Boutique modules docked in optional K-25m Keyboard Units. The JP-08, JU-06, and JX-03 modules are incredibly small, and easily slip into a travel bag for making music anywhere you want. Each runs on USB bus power or batteries, allowing you to go from your computer DAW to stage performing with ease. Every module also includes a built-in powered speaker, a cool feature for monitoring the sound while you’re on the move. JP-08, JU-06, and JX-03 modules in the studio. You can learn more about the Roland Boutique modules in this previous post and at RolandUS.com. To go further behind the scenes, read this in-depth interview with the Roland Boutique developers. 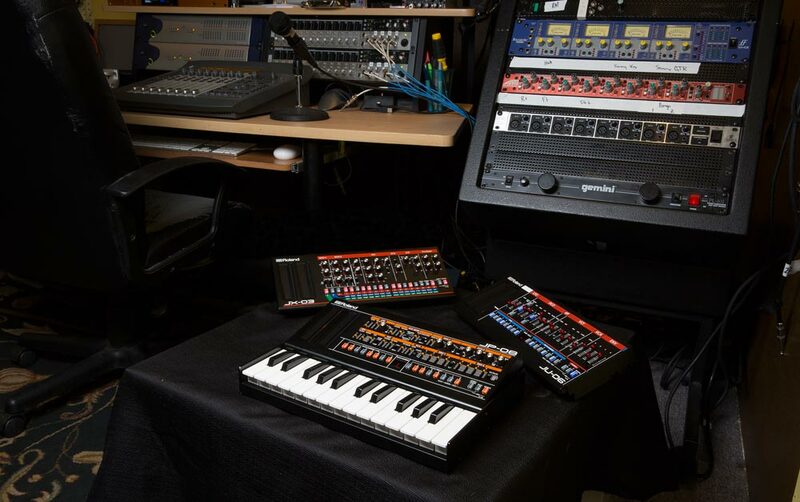 To learn the inside stories on the development of the original JUPITER-8, JUNO-106, and JX-3P synths, be sure to check out this cool interview with the lead Roland engineers behind these legendary products. If you’re a fan of old analog synths, you don’t want to miss this one!